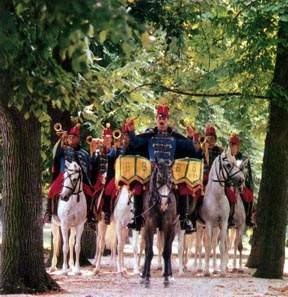 On the advice of his Cuirasser Captain, József Csekonics, the Emperor Joseph II established the Bábolna Stud Farm in 1789 in order to breed fast horses with great endurance for his cavalry. The stud yard still maintains the atmosphere of its historic origins. The Shagya Senior stallion, purchased from the Bedouins in 1836 by Bábolna, produced several distinguished offspring. The Bábolna-originated, pure-bred Shagya-Arabian breed was named after this stallion. Bábolna is indebted to the breeding specialists Herbert Eduard, Rezsõ Brudermann and Mihály Fadlallah el Hedad for their expeditions to Arabia which helped strengthen the breed. Tibor von Pettkó-Szander was also prominent in enhancing the Shagya-line, and published a book on Hungarian-style carriage driving. The Bábolna Stud Farm won the Grand Prize at the 1900 World Exhibition in Paris. Since then, they have continued to accumulate additional prizes, awards and distinctions in various equestrian competitions throughout Europe. The Bábolna Stud possesses one of the largest Arabian stud herds in Europe, consisting of some 200 horses, among them 9 breeding stallions and 72 breeding mares. Pure-bred Arabian and Shagya breeding is carried out there based on our centuries-long tradition. Our pure-bred Egyptian Arabian horses represent a distinguished value in breeding. The pure-bred Shagya-Arabian is unique in international Arabian horse breeding. The Shagya-Arabian breed, originating from Bábolna, is widely-recognized as symbolizing the results of the Stud's breeding activity. Presently, 1350 breeding mares and stallions are registered by the International Shagya Association (ISG). In close cooperation with the ISG, Bábolna, as the major Stud, does its best to help Shagya breeders achieve even greater successes. The Shagya breed is characterized by its elegance, harmonic movement, unique good will, and aptitude to learn. In addition, Shagya's possess peerless working capacity and ideal measurements. These characteristics make Bábolna-bred horses the most devoted companion for the breeders, sportsmen and hobby riders. Equestrian Photos Examine some photos of these magnificent horses.